Some Samsung device owners are having a bit of a freakout over the last couple days, and the cause is a something as minor and innocuous as an app update. 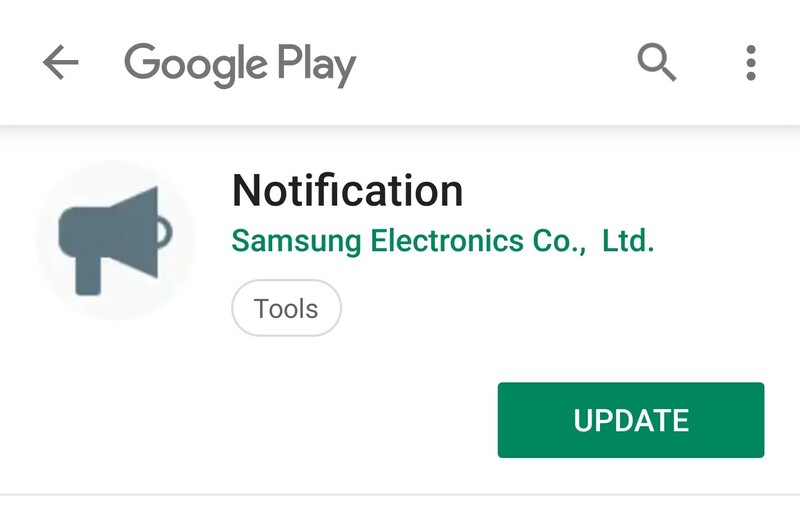 A new version of a built-in "Notification" application is rolling out to some via the Play Store, and while seeing an app that you don't recognize request an update can be a bit concerning, Samsung's choice when it came to the app listing's screenshots were not great. Precisely nothing sketchy about an app you didn't know you had requesting an update and showing screenshots saying your phone is locked and asking for your PIN number. Seems legit. The app listing shows a pair of screenshots that include a dialogue to enter a PIN number for a Russia Bank account, paired with no app description. In total, the app listing seems odd, if not downright sketchy. 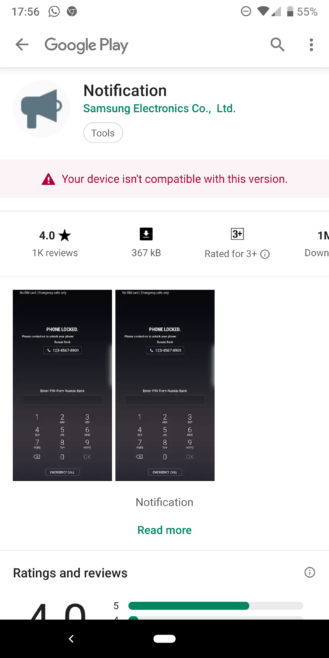 However, that Play Store listing and its associated update don't appear to be valid for everyone, and we aren't sure what the restrictions for it on the Play Store may be. For example, I'm unable to access it myself in the US on a Galaxy S9, though one of us in France on the same device had no such trouble, and another in Lebanon on a Pixel 2 XL had no issues. But whatever restrictions are placed on its visibility, so far as we can tell it's a legit app listing with a real update. For the update to be accepted to the Play Store and subsequently installed onto your device, its signing key would have to match that used by Samsung for previous versions of the app. Someone would need access to either the app's signing key or a compromised upload key (if Samsung uses Google's cloud-based app signing) and an account with credentials to upload updates to Samsung's Play Store developer account. It's more likely someone at Samsung merely made a poor decision with the pair of screenshots. Full app listing screenshot, including recent negative reviews. Click/tap for a bigger view. To be doubly sure, we've reached out to Samsung for comment about the app and its associated update on the Play Store. If we hear anything more, we'll let you know. But in the meantime, we urge you not to worry. If it really bothers you, just hold off on updating for now.